PML's Dan Hussey in the shielded cave where the neutron microscope will be housed. When the world's first workhorse neutron microscope – currently being designed and built by a collaboration including NIST's Physical Measurement Laboratory (PML), NASA, and MIT – is ready to be used in a few years, it could revolutionize the field of neutron imaging, with applications for studying lithium batteries, hydrogen fuel cells, strain within metals, and more. The device should be able not only to concentrate neutrons onto a specimen but also magnify the image, allowing for an estimated 10-fold increase in spatial resolution (and 100-fold increase in time resolution) over what is currently possible. Last fall, the PML team launched a facility on NIST's Gaithersburg campus for creating and manipulating neutrons with the correct energy range for use in a neutron microscope (see "On the Road to a Neutron Microscope"). Now, the collaboration is approaching a new milestone for the project: the realization of a new design for a neutron lens, whose first prototype should be ready this summer. Neutrons reveal aspects of objects that can't be seen with light, explains PML project leader Dan Hussey. Because of their quantum properties, these chargeless particles react in seemingly bizarre ways to materials. For example, some substances, such as water, block them. Others, such as lead and aluminum, are essentially neutron windows: The particles pass straight through. If you shot a neutron beam at a lead bucket full of daisies, your image would reveal the daisies. Their properties make neutrons useful for imaging the inside workings of objects that are opaque to light, such as hydrogen fuel cells, of interest as a relatively green source of energy. But neutrons are difficult to manipulate because they go through most mirrors unless they hit their surface at a low angle of incidence, like a stone skipping on water. So the collaboration has taken inspiration from a type of lens already used for some kinds of x-ray imaging. The lens, called a Wolter optic, is a series of conical mirrors made of thin layers of highly polished nickel. Neutrons that hit a nickel cone at a shallow enough angle will bounce off the inside of the mirror and be focused. If the neutrons hit the mirror at too steep an angle, they will pass right through it. 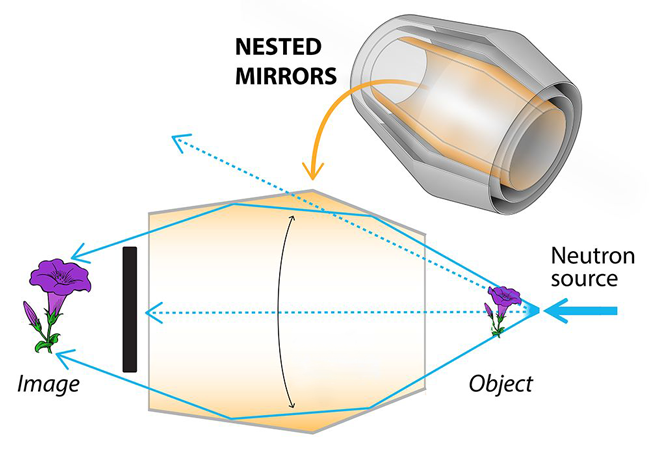 Like other Wolter lenses, the neutron microscope design calls for nesting the mirrors inside each other like the layers in an onion, to increase the chances that if a neutron shoots through one mirror it will ricochet off the next. The first mirror shell for their Wolter lens should arrive at NIST this spring and will be the prototype for an optic system designed for high-speed imaging. When complete, the optic will consist of about 10 nested mirror shells, with a maximum diameter of approximately 15 cm (about 6 in) and a total length of approximately 20 cm (about 8 in). It should have a resolution of 20 micrometers (millionths of a meter), less than half the diameter of a human hair. Eventually the researchers will also test a second lens system optimized for resolution, capable of distinguishing features only a single micrometer apart, but this model is still being designed. While they wait for the first lens to be finished, the team is outfitting a shielded cave, a long room in which the sample, lens, and detector will sit. The neutrons are guided into the cave after being produced by NIST's research reactor. Hussey and colleagues are also developing a system that will take the image created by the Wolter optics and flatten it out. "The focal point for the Wolter mirrors isn't flat. It's curved," Hussey explains. "So we're doing studies now on how to deal with the field curvature." The higher resolution that scientists will be able to achieve with the microscope could shed light on the processes inside hydrogen fuel cells, particularly in the catalyst layer, where the hydrogen fuel and oxygen from the atmosphere are combined to create the energy that powers a car or light bulb. A byproduct of this reaction is H2O, and the creation of this water – and where exactly it goes within the cell – is important to understand in studies of hydrogen fuel-cell efficiency. Water, with its high hydrogen content, shows up clearly in neutron images. "The catalyst's layer is on the order of 1 to 10 micrometers, which is beyond our current spatial resolution," Hussey says. "Being able to see inside the catalyst layer and understand the water transport in hydrogen fuel cells would be huge."